The Zenport QF no 8 bypass pruner is an ergonomic re-design of the original Zenport QF no 2 pruner. 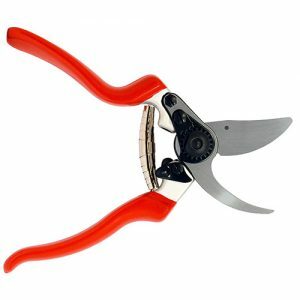 This pruner is the same as the Zenport QF no 7, but without the rotating lower handle. Super strong and light alloy handles are shaped to act as an extension of the hand and forearm. The anvil blade handle is designed to prevent the pruner from sliding through the hand. Precision hollow-ground, hardened steel blade featuring a wire-cutting notch. The blades are set on dowel pins for easy maintenance and replacement. Available professional replacement parts are compatible in performance and design with equivalent Swiss industry standard models.